Visit the cradle of the Minoan civilization, the palace - labyrinth of legendary King Minos and its mythical Minotaur. Book the services of a qualified guide and make your visit a memorable one. A site of Cretan Tour Experts travel agency, organized by qualified licensed guides, specialized in private tours. 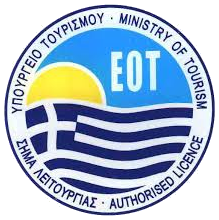 (EOT – GNTO 1039 Ε 6061 01904 01) organized by professional experienced guides, active on the island Crete. We have realized, that many guests visiting Crete and mainly the prefecture of Heraklion, wish to visit the highlights of the Minoan civilization, the palace of legendary King Minos – Knossos and the new reorganized archaeological museum of Heraklion (according to the reviews of the visitors , one of the best museums of Greece!). Our travel agency, Cretan Tour Experts, focuses on how to make as easy as possible, the booking of a professional licensed guide in order to visit those two amazing archaeological highlights of the area of Heraklion. Book directly the services of a qualified licensed guide during your vacations on Crete and meet your qualified licensed guide at the desired site (main entrance of Knossos or main entrance of the archaeological museum of Heraklion). The service – to arrange an appointment and meet the qualified professional guide at the entrance of the desired site – can be arranged in many languages (English, German, Polish, Russian, French, Italian, Spanish, Portuguese) and of course upon request in other archaeological sites of the island (subject of availability/guide close to the requested area/site – send us an email at visitknossos@gmail.com). Make your arrangements according to your time schedule and your wishes and meet your qualified guide at the site you prefer to visit the most. Now you have the option to visit Knossos only (just the archaeological site), the archaeological museum of Heraklion, or to combine both sites. You can choose to visit the new reorganized museum of Heraklion, in order to see the most important artefacts of the Minoan collection or you can choose the extended combined tour of both sites, for a more in depth explanation and understanding of the Minoan Civilization. Our qualified tour guides, can make the difference and create a unique travel experience. Explore the largest Minoan palace of Crete, Knossos, follow our expert guides as they unveil the secrets of the Minoan culture. Our tours are flexible and our guides can adapt the tour to your wishes. We have chosen to cooperate with few dedicated professional licensed guides that share the same passion and have the same philosophy, as we do. To us, customer satisfaction is our number one priority. In addition, our guides have the credentials and possess the legal license to guide you in all archaeological sites (on Crete and Greece). Furthermore, our guides attend seminars during winter (low season period) in Athens and universities abroad, constantly seeking ways to improve themselves and the way we present to you the Minoan civilization. Visit Knossos, visit the Archeological museum of Heraklion or explore both sites, with experienced guides of our team. In order to maximize the experience, we propose an appointment with your licensed guide for a visit of Knossos palace or the museum, after midday in order to avoid the crowds or the morning tours busses. As a registered travel agency, we can provide the services of a qualified guide for any group (for a bus tour or minivan) and we also have licensed guides available in other languages upon request (in case you have a small group that is not included in our booking options, please contact us) We can provide B2B services to travel agents or tour operators from all over the world, in any of the archaeological sites on Crete (upon request), to meet the guide at the entrance of the desired site. We can arrange family friendly tours to Knossos, focusing on mythology, even using 3D virtual and augmented reality, a modern technology and a fresh approach with an iPad application, to make it as easy and interesting as possible to the children. So follow us, in the quest of the Labyrinth and the legendary Minotaur (Tour can be conducted with or without the use of iPads, but always with a family friendly approach, making the site interesting to our young friends). Road Tour – chauffeur service: Our Travel agency is offering the chauffeur service, with registered licensed guides, so that you can take advantage of every second, even on the way. Don’t miss the chance to combine the tour with a transfer instead of loosing valuable time on the way, you can visit the sites or cities and highlights on the way and end up at your next hotel with the safety and comfort that you deserve. Our company cars are registered as well and they have a permission issued by the Greek National Tourism Organization and are checked annually in order to secure high standards. Chauffeurs / licensed guides of Cretan Tour Experts Travel Agency will treat you and your guests to an experience you will not want to forget. We truly look forward to assisting you with all your transportation needs. Combine the transportation with a tour and maximize the experience. Your valuable time is our number one priority. We have decided to provide a food tour at Heraklion, combined with a walking tour through the pedestrian streets and the main market with the shops. The qualified guides of our team will guide you through the Venetian buildings of Heraklion and explain the fascinating history of the Venetian Era, you will have the chance to explore the modern Heraklion, but more important to taste the local cuisine. Seize the opportunity to taste the real Crete and feel the warmth of the Cretan hospitality. Taste the Cretan products and they will lead you back to Crete. So bring your cameras and your smile and follow us to explore the highlights. We aim to make your visit at Heraklion and Crete, a unique experience. Join us!